There’s a bit of a 1950s vibe going on with the Vintage Typography Duck Egg Blue Wedding Invitation from Flourish & Lace and we love it! Sporting a clean and simple design, this A5 wedding invitation is totally unique and boasts all the right detail in all the right places! 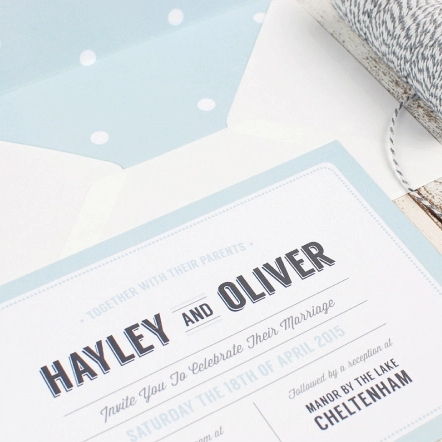 From the gorgeous border that has been perfectly printed and finished off with tiny little dots around the edge to the 3D effect of the bold font and the polka dots inside the envelopes, the attention to detail here is spot on and seamless – just as every Bride wishes her wedding day to be! If you and your partner are not one for lacy frills, Swarovski crystals, dainty flowers and busy patterns, this wedding invitation could be perfect to satisfy your desire for simplicity and sophistication. Equally, those of you who have a penchant for retro design will appreciate its easy-on-the-eye style that is so evident in the graphics that came out of the ‘50s. We can’t help but think this particular design would have worked really well as a poster back in the day, advertising a band’s gig. A couple with slicked back black hair, a well-cut blue suit and a pretty girl in a waist-cinching dress eagerly waiting outside in the queue waiting to hear the latest rock ’n’ roll tunes.